Mountain’s Edge master-planned community is carving its place amidst the mountainous and desert landscape of Las Vegas, Nevada. 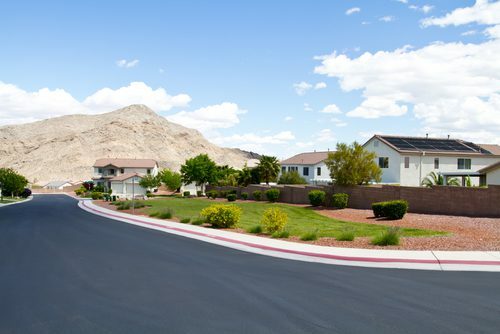 The Mountain’s Edge community in 89178, in Southwest Las Vegas, consistently earns its place among the nation’s top ten selling communities, ranking number one for four consecutive years. Focus Property Group, the developers of the Mountain’s Edge community, believes in their responsibility to plan and protect the desert’s natural resources. The mountains of Las Vegas each tells a story, some with petroglyphs left by ancient nomad Indian tribes, others with trails created by frontiersman and pioneers. And now, Mountain’s Edge community writes into history its story as a community thriving in the heart of the Nevada desert. Mountain’s Edge community includes two parks: Exploration Park, and Nathanial Jones Park, as well Mountain’s Edge Regional Park, which is maintained by Clark County. The parks, combined, provide over three hundred acres of hiking, biking and walking trails; greenways; water features; picnic areas; and playgrounds. Landscaping in the area minimizes the use of water with appealing designs using lush desert flora. Focus Property Group invests itself not only into the preservation of natural resources but also in replenishing resources that have been depleted by people. For example, a park at the community’s entrance was revegetated with 10,000 native yucca and creosote plants in keeping with the area’s natural habitat. Mountain’s Edge hosts several events scheduled throughout the year, and the developers have several philanthropic endeavors to give back to Community of Las Vegas, including a Candlelighters 5k run to support children with cancer. Mountains Edge is a community in Southwest Las Vegas, in the zip code 89178. It's a large, growing community with homes in various sizes, amenities and price ranges.